EAGAN, Minn. — Dan Bailey is ready for the sense of normalcy that can be built by a kicker with a full offseason program. The veteran signed with the Vikings on Friday as he is set to return for his first full season in Purple after joining the team in Week 3 of the 2018 season. Bailey made 21 of 28 field goals with the Vikings along with 30 of 31 extra point tries. Despite the lower percentage than usual in 2018, Bailey still ranks fifth all-time with a field goal percentage of 86.6, having made 207 of 239 field goal attempts. The 31-year-old spoke to Twin Cities media members Friday afternoon on a conference call and talked about his excitement in going back to Minnesota. “Obviously there’s a little bit to be desired there on my performance … I’d like to get that percentage up,” Bailey said of his 2018 season. “But I think, honestly, it’s getting that full offseason in with Kevin [McDermott] and Matt [Wile] and whoever else we’re going to be working with. Just getting synced up with that and being around each other more and getting a lot more reps together. Bailey’s last full season came in 2016 when he made 27 of 32 field goals (84.4 percent) and all 46 extra point tries. He latched on with Minnesota early in the 2018 season as the kicking operation worked to find a groove. 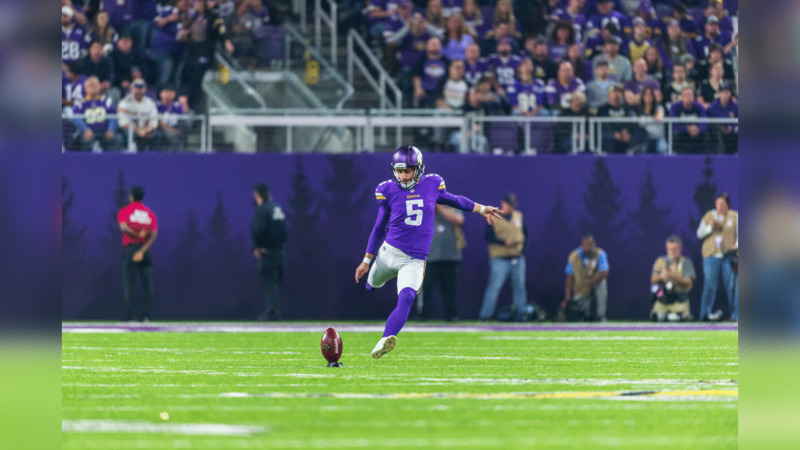 McDermott has been the Vikings long snapper since 2015, but Wile was signed as the punter (and holder) before Week 1 of the 2018 campaign. Bailey said Friday he’s looking forward to working with his fellow specialists right away when the Vikings open their voluntary offseason workout program on April 15. Bailey also will be working for the first time with Marwan Maalouf, who was hired as the Vikings Special Teams Coordinator in February. While Bailey said he hasn’t had much personal interaction with Maalouf, the kicker has asked around and heard positive reviews. “I honestly didn’t know too much about him … just a little bit from guys who had worked with him before at the specialist position,” Bailey said. “Everything I had heard had been positive and then down there in Miami where he was for a little bit, they always have good special teams units down there. I didn’t have a ton of knowledge on him but everything was positive as far as I knew. I’m looking forward to working with him. And there is a chance Bailey could have a coach directly assigned to him, as Vikings Head Coach Mike Zimmer revealed at the 2019 NFL Scouting Combine that he is entertaining the idea of hiring a “true kickers coach” this offseason. Bailey said Friday he actually has experience with a similar coach. Bailey noted that from 2011-2013 when he was with the Cowboys, the team employed former NFL kicker Chris Boniol, who played in the NFL from 1994-1999. Boniol, who made 128 of 163 career field goals (78.5 percent), was the Cowboys kicker from 1994-1996, when Zimmer was on the Dallas coaching staff as a defensive backs coach. He was hired in January by Tampa Bay. “He was more or less a special teams assistant, but also a kicking consultant because he had been there and done that before, so I have a little bit of experience with that,” Bailey said of Boniol. “My opinion is that if it makes sense for any organization to bring somebody like that in … another set of eyes are not going to hurt.